Rail lines in east Cornwall have received special new designations in an attempt to attract more passengers. The Looe Valley line, from Liskeard to Looe and the Tamar Valley line, from Plymouth to Gunnislake, have now been named as community rail routes. 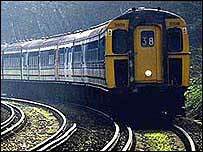 On the Looe Valley line improvements will include a regular hourly service during the summer. There will also be catering and information on the branch platform at Liskeard and branded rolling stock. On the Tamar Valley line developments will include carnet tickets at discounted prices, links to local attractions and access from the line to the cycle track network. In other parts of the UK, community rail designation has improved passengers numbers by up to 300%. Colin Jarvis of Cornwall County Council said: "We are pleased that these Cornish branch lines have been selected as national pilots for Community Rail and we very much support this initiative. "Already many potential improvements for both services have been identified and we are committed to working to ensure a successful future for the lines." "The Strategic Rail Authority wants to see more local partnerships"